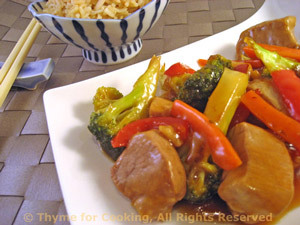 Sweet and Sour Pork, easy gourmet dinner recipes. This is based on one form '1000 Chinese Recipes' cook book. This is not the kind made with canned pineapple, which I think is horrid, but an actual real Chinese recipe. In the interest of health and simplicity I did not batter and deep-fry the pork first. I used to. This way is just as good and I don't have to haul 3 cups of hot, smoking oil out to the back garden to toss. Cut the pork into 1" (2.5cm) cubes. Heat oil and soy sauce in nonstick skillet. Add pork and stir-fry 5 minutes. Add chicken stock, reduce heat to low, cover and simmer 10 minutes or until done. Dissolve cornstarch in chicken stock, soy sauce and set aside. In large nonstick skillet heat remaining 1 tbs oil over medium-high heat. Add garlic, ginger and stir-fry 30 seconds. Add carrot, broccoli, pepper and stir-fry 2 - 3 minutes. Add stock, sugars, vinegar and soy sauce and bring to a boil, stirring until sugar is dissolved. 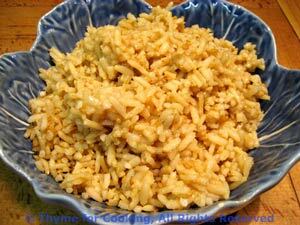 Give cornstarch a stir to recombine and add to sauce, stirring until thickened. Remove pork from pan juices and add to sauce. Stir well, heat through and serve.